What is CBD Pain Freeze? Hemp Bombs CBD Pain Freeze is a premium CBD topical infused with the soothing qualities of Menthol and Camphor Oil. It features the medicinal properties of CBD, or Cannabidiol, which may help relieve inflammation, reduce chronic pain and provide support to your bones, joints and muscles. CBD Pain Freeze is formulated to absorb deeply without leaving a sticky residue. This deep-penetrating CBD rub is a popular choice among athletes, senior citizens, post-surgical patients and sufferers of arthritis. CBD Pain Freeze is also great for everyday use, as it allows you to absorb a daily dose of CBD extract to help promote overall wellness. Our Pain Freeze may help you restore mobility, sleep more comfortably and relieve even the most stubborn pain. 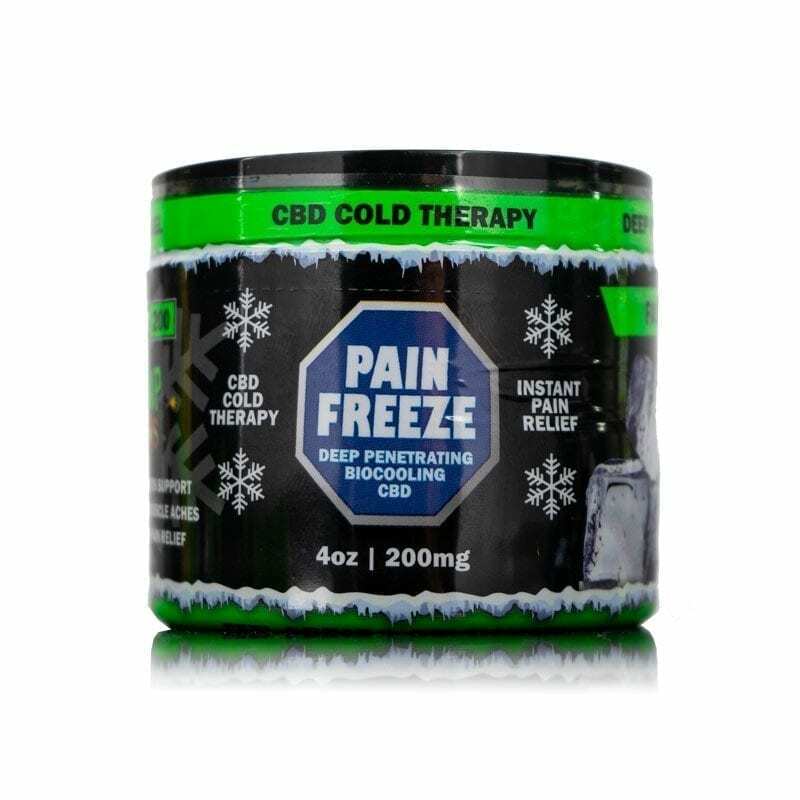 How do I use CBD Pain Freeze? You can apply CBD Pain Freeze to specific targeted areas on your body, or you can massage it into large muscle groups. Apply Pain Freeze in thin layers and rub it in deeply for maximum benefits. While it can help deliver long lasting results, you can apply it up to four times per day. We recommend avoiding the eye area when you use CBD Pain Freeze. When using any topical product, it’s essential to clean the area of application before use. By starting with clean skin, you are allowing more of the product to penetrate into your skin and absorb into your muscles and tissue. This is especially important when using a CBD topical. If possible, it is a good idea to exfoliate before using Pain Freeze to reveal a fresh layer of skin. If you plan to use CBD Pain Freeze on large muscle groups, consider applying it after you shower. 2. Remember a little goes a long way. Like all Hemp Bombs CBD products, our CBD Pain Freeze features a high-potency dose of our premium CBD Extract. While there is no harm in taking a high dose of CBD, our customers often mention our Pain Freeze is more powerful and potent than other CBD topicals on the market. If you’re new to Hemp Bombs CBD or CBD topicals, we recommend starting with a small amount and applying a thin layer. As you see how CBD makes you feel, you can apply more until you’ve achieved your desired results. Keep in mind more severe or widespread pain may require a larger amount of Pain Freeze. Our cooling Pain Freeze was specifically designed to penetrate deeply and massaging it into your skin can help provide faster absorption. 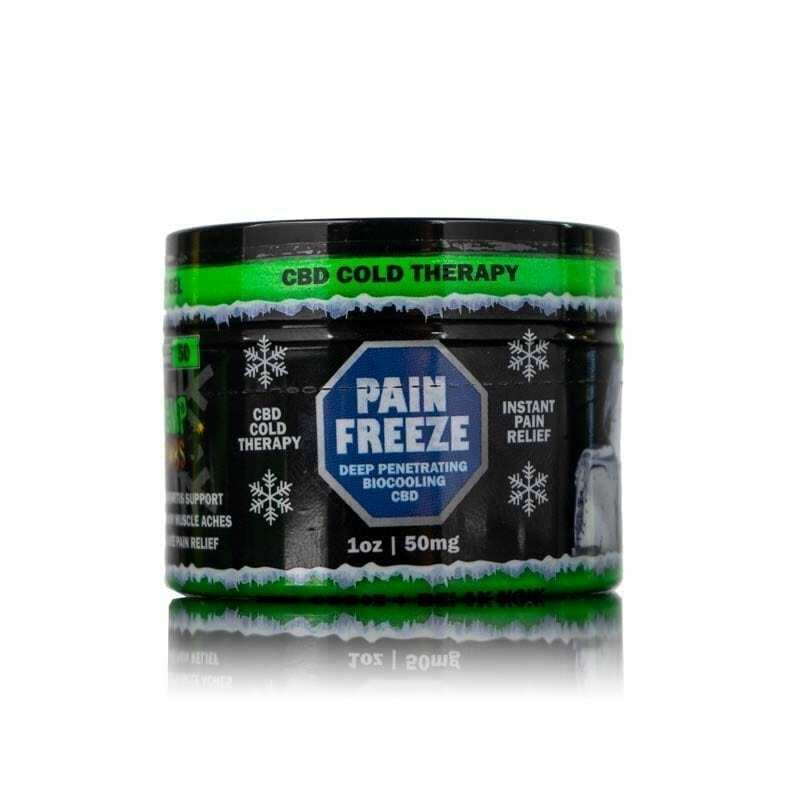 CBD Pain Freeze works by absorbing into your skin, tissue and muscles to help naturally relieve pain and inflammation. That means it is more effective when it is rubbed in deeply rather than just lightly applied to the skin’s surface. Hemp Bombs CBD Pain Freeze typically does not leave a residue when properly rubbed into the skin. 4. Pair CBD Pain Freeze with other forms of CBD. If you’re applying a CBD topical to help relieve intense or persistent pain, it may be a good idea to also explore other forms of CBD. Oral or edible products, including CBD oil, CBD gummies, CBD capsules and CBD syrups can help promote the medicinal benefits of this powerful cannabinoid from within your body, whereas CBD Pain Freeze is a targeted product absorbed through the skin. For an added boost of benefits, try pairing your CBD Pain Freeze with other CBD products. You can customize your CBD regimen until you find a balance that is best for your needs. 5. Wash your hands after applying. Our CBD Pain Freeze can feel fantastic when applied to your skin, but you’ll likely experience a not-so-pleasant feeling if it accidentally gets into your eyes. After you apply your CBD Pain Freeze, wash your hands to ensure you don’t accidentally get any in your eyes or in the food you eat. (Pure CBD extract itself is safe to consume, but some of the other ingredients are not meant for consumption.) It’s important to get in the habit of washing your hands after applying any topical pain relief product, whether it contains CBD or not. Bonus Tip – Try CBD Pain Freeze for massage. As the benefits of CBD topicals become more apparent, it’s not uncommon to find spas that offer CBD oil as a deluxe upgrade to common massage services. CBD massage helps the extract absorb deeply into your body while promoting a full-body relaxing experience. Our CBD Pain Freeze gives you an opportunity to create a CBD spa-like experience in the comfort of your own home, and for a much more affordable price. Enjoy the relaxing benefits of CBD extract by using our Pain Freeze just like you would use a standard massage cream or oil product. Available in 50mg or 200mg sizes, Hemp Bombs’ CBD Pain Freeze is a high potency, premium CBD topical that can have wide-ranging benefits for a variety of pains and conditions. Want to try it for yourself? Shop now! Still loving the pain freeze and gave samples to 3 friends with various pains. As you can see have gone from 2 for hubby and me to 5 for 3 more friends. They are so excited to be getting 1each. I had gotten the 1oz. size of 200mg at my local vape shope and they had a sample <so before i bought it i tried it,WOW!! let me tell you this stuff works great. Instant relief. My husband found this at the gas station, this is the ONLY thing that has helped my severe knee pain! I struggle daily with the pain & no narcotic, NSAID, icy hot, biofreeze etc has helped. This is a miracle for me, I’m able to function. I have a skin condition called Bullous Pemphigoid that caused extremely itchy blisters. This product is the only thing I’ve found that not only stops the itching, but helps to heal the open blisters. I was originally put on high doses of steroids and chemo to control these blisters, but am using a compound made for me by a Holistic DR, and this great product!! This is an excellent product!! As a Nurse and someone who suffers with chronic pain, I choose not to use conventional pharmaceutical drugs for pain, I cant begin to tell you how much I appreciate this product, a few minuets after application ( a thin layer rubbed deeply into my lower back) I was pain free, for the first time in weeks! Excellent product, and I will be a long term customer. this is an awesome product line . my grandmother loves the pain freeze and my mom too. the gummies are the best my girlfriend swears by them , my mother says they are great too. we Love Hemp Bombs . thanks for a great product. I love it. My mom loves it and she had me ship one to her sister who loves it!